With National Poetry Month just around the corner the Farnsworth Art Museum will host a number of poetry readings as well as a poetry workshop in April to celebrate National Poetry Month. On Tuesday, April 2, 2019, at 2 p.m., Maine Poet Laureate Stuart Kestenbaum will deliver a poetry reading in the Farnsworth Library. 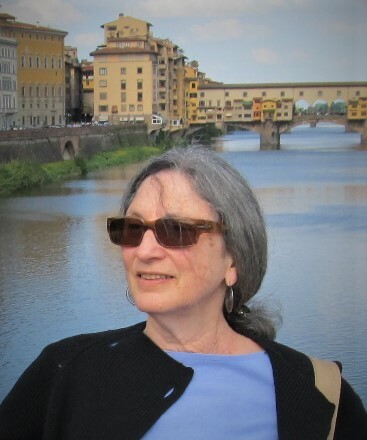 Kestenbaum is the author of four collections of poems: Pilgrimage (Coyote Love Press), House of Thanksgiving (Deerbrook Editions), Prayers and Run-on Sentences (Deerbrook Editions), and Only Now (Deerbrook Editions), as well as a collection of essays, The View From Here(Brynmorgen Press). 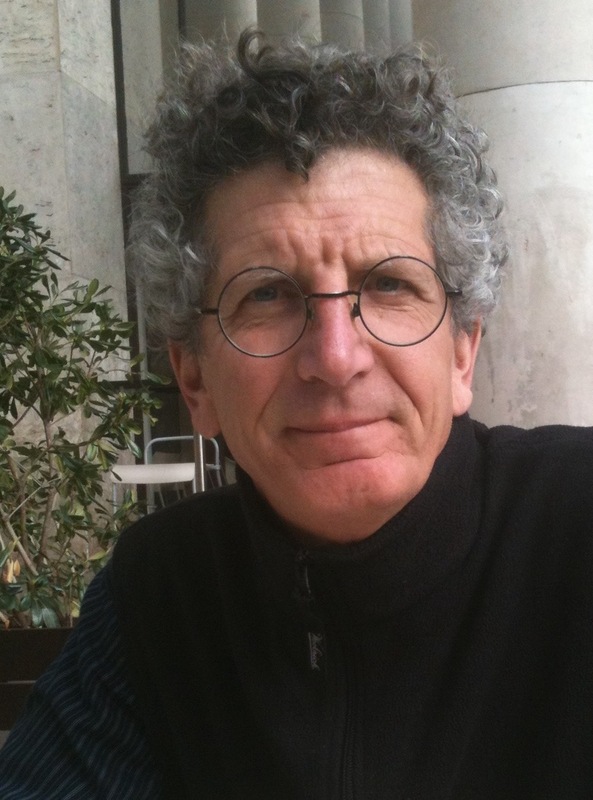 A former director of the Haystack Mountain School of Crafts in Deer Isle, Kestenbaum has written and spoken widely on craft making and creativity, and his poems and writing have appeared in numerous small press publications and magazines including Tikkun, The Sun, and the Beloit Poetry Journal. He was appointed poet laureate of Maine in 2016. The fee for this program is $10, and includes gallery admission to the Farnsworth Art Museum. 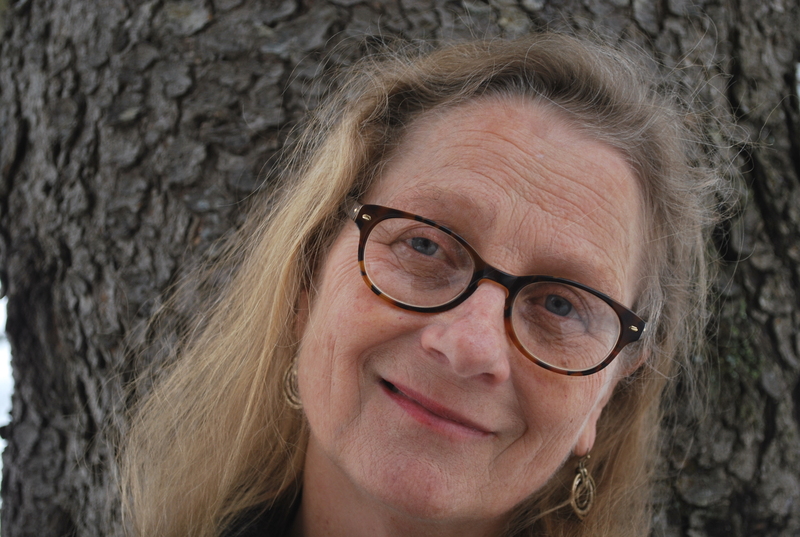 Award-winning poet Kathleen Ellis will lead a poetry workshop on “Inventing New Poetic Forms” on Saturday, April 13, from 10 a.m. to 2 p.m. at the Farnsworth’s Gamble Education Center, 12 Grace Street in Rockland. Participants will expand their range of poetry writing styles and forms by intermeshing poetry and photography, memory, culture, and current events. Using selections from Teju Cole’s Blind Spot and works by Forrest Gander, Claudia Rankine, Cole Swensen, Wislawa Szymborska, and others as conceptual starting points, participants will jump-start four new “lyrical-essay poems.” The fee for this half-day workshop is $56 ($48 for museum members), and all abilities are welcomed. At the Farnsworth Library on Friday, April 19, at 2 p.m., poet Kristen Lindquist will present “Digging for Gold: Responding to Art through Poetry.” seventeenth-century Dutch and Flemish Golden Age that produced such masters as Rembrandt and Vermeer. Lindquist will discuss the creative activity of written reflection on a work of visual art, known as ekphrastic writing, and share her poem series Goldenalongside images of the seventeenth-century Dutch and Flemish paintings that inspired them. The fee for this program is $10, and includes gallery admission to the Farnsworth Art Museum. Another program focused on ekphrastic writing, “The Art/Poetry Connection,” will be held on Tuesday, April 23, at 2 p.m. in the Farnsworth Library. Poet, teacher, and author Ellen Goldsmith will lead a participatory presentation that places eight poems beside the images that gave rise to them—Yusef Komunyakaa and Maya Lin; E.D. Hirsch and Edward Hopper; Lisel Mueller and Claude Monet; and more. The workshop will end in the museum galleries to see which works of art stimulate thinking and feeling and might lead to writing. The fee for this program is $10, and includes gallery admission to the Farnsworth Art Museum. Elizabeth Tibbetts’ poems reflect her attachment to Maine and her family’s history here, her love and fears for the natural world, and her experiences as a local nurse. Tibbetts will read from her books, including In the Well, which won the Bluestem Poetry Award, and her just-published book, Say What You Can, as well as poetry from others, including Kate Barnes, Maine’s first poet laureate, on Tuesday, April 30, at 2 p.m. in the Farnsworth Library. The fee for this program is $10, and includes gallery admission to the Farnsworth Art Museum. Maine is fortunate to have several amazing art museums and other venues to view art work by outstanding artists. Some of my favorite artists and art work are on display throughout the summer and into the fall. I hope that you take time to visit one or more of the following and consider taking your students to the shows. Check them out. Please note: these are not the only shows at these locations nor are they the only locations and shows taking place this summer. Support your local art venue! The Farnsworth Art Museum, located in Rockland, has a full schedule of opportunities this summer and into September. On May 20 over 585 visitors attended the opening event of the yearlong Stories of the Land and Its People 2018 exhibition. Attending the event included students, families, educators, artists, and community members. 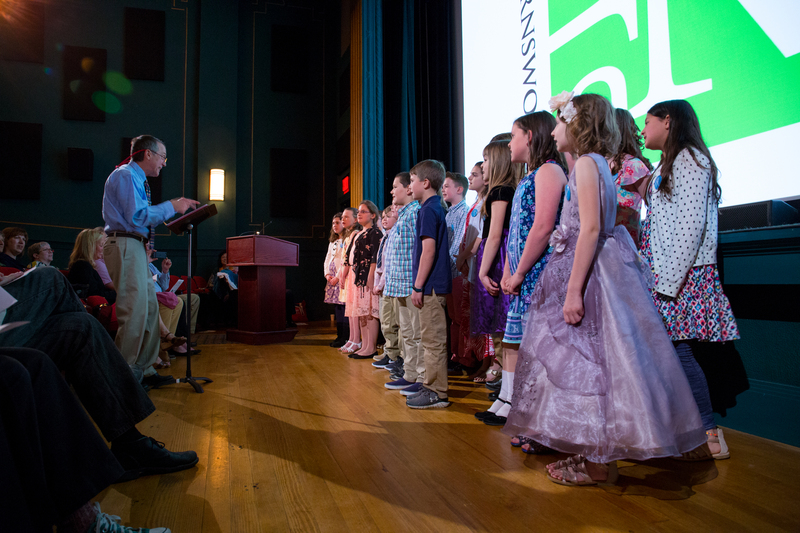 The event kicked off at the Strand Theatre in Rockland with a red carpet entrance and three original performances by 4th grade students at Lincolvnille Central School, Appleton Village School, and Rockland’s South School. Everyone enjoyed poetry readings, films, puppet shows, and collaborative projects by over 165 midcoast students. Eighteen educators and artists were honored at the stage. The exhibition is on view until September 9 with a special tour on July 11, 1:30. 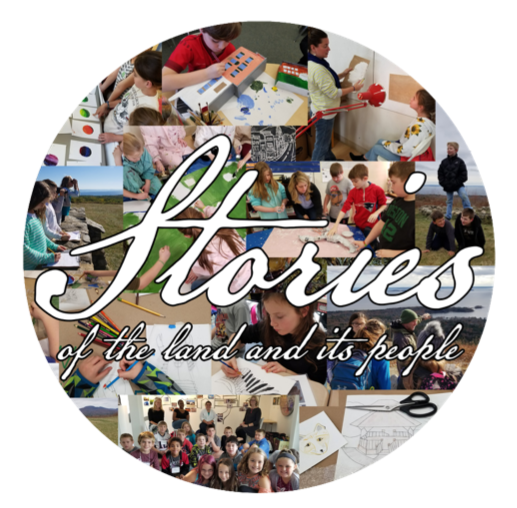 Stories of the Land and Its People program includes 4th and 7th grade students who used the art experience to study a variety of subjects including Maine studies, science, environment, poetry, geography, and more! The exhibit includes interactive stations, digital work and touchable items created for visitors to enjoy. 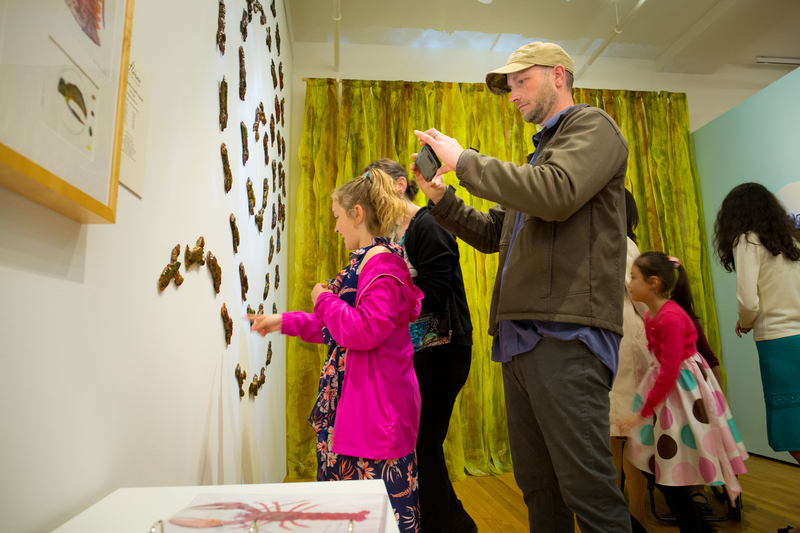 The museum provides this arts in education program free of charge to Mid-coast Maine schools. Funding is provided by several organizations including the Maine Arts Commission. 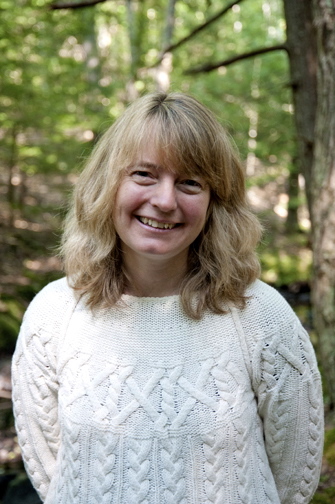 The Farnsworth’s Stories of the Land and Its People program was developed and led by Andrea L. Curtis, Arts in Education Program Manager, and celebrates its 7th year working with local Maine schools. The Wyeth Experience, Fridays and Saturdays through, July through September, 9:45 a.m. – 12:45 p.m. Tour begins at the Wyeth Center. The tour includes an intimate look at select Wyeth works at the Farnsworth’s Wyeth Center, and continues by van to the Olson House for an in-depth tour. 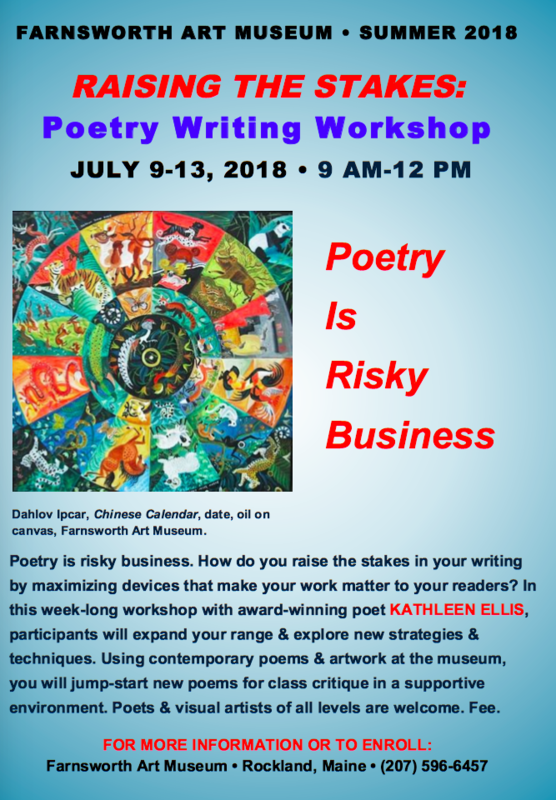 Raising the Stakes Poetry Writing Workshop with Kathleen Ellis, Monday – Friday, July 9 – 13, 9 a.m. – noon, Gamble Education Center. 10 a.m. – 4 p.m., Gamble Education Center. The Farnsworth Art Museum in Rockland announces a unique opportunity: Winter Windows Project – Deadline for submission of ideas: June 1, 2018. Submission information. Farnsworth Winter Windows is a Farnsworth Art Museum project designed to showcase the work of Maine artists in our Main Street windows through temporary installations of original artwork. The Museum seeks proposals from artists to create a site-specific installation for display in the windows of the Farnsworth Art Museum from November 23, 2018 to January 15, 2019. This initiative will add an exciting component to the downtown streetscape during the holiday months, coinciding with Rockland’s Celebration of Lights and the Farnsworth’s Share the Wonder Celebration. The finalist will received a $2,500 award, inclusive of all expenses involved in the project. Individuals, or teams of artists in Maine are eligible to apply for participation. Participants must be 18 years or older. All media will be considered. The project invites submissions from artists including but not limited to architects, filmmakers, graphic designers, painters, photographers, sculptors, textile designers, and woodworkers. Artists may submit proposals individually or as a group. One submission per artist, please. Proposals should include a one-page written description of the concept for the work, including dimensions and materials; one to three sketches of the proposed work (e.g. front view, detail); and one-page artist resume. Artist teams may submit a single-page resume for each team member. The entire proposal, consisting of the description, sketches and resume(s) must be submitted as a PDF document. Sketches must accurately represent the work proposed; works not accurately represented may be disqualified. Entries should be complete by June 1, 2018. The finalist will be informed by August 1, 2018. The Main Street window space is 82 inches high by 464 inches wide and 36 inches deep. The space comprises the four pairs of windows to the immediate right of the Farnsworth Administrative entrance, directly on Main Street. VIEW and DOWNLOAD a schematic of the space. Proposals will be reviewed by Michael K. Komanecky, Farnsworth Chief Curator; Anneli Skaar, Farnsworth Creative Director; and Tom Weis. Weis is a designer, educator and cofounder of Steel House in Rockland. Weis holds a master’s degree in industrial design from the Rhode Island School of Design, where he also teaches. His work has appeared in the Cooper Hewitt National Design Museum, Time Magazine and The New York Times. The finalist will meet with Farnsworth staff in August to see the Main Street window space, and to discuss installation requirements and parameters, including the schedule. The finalist is responsible for delivering and installing the work in the Main Street windows, and for removing the work following the end of the project. If there are any substantial changes to the work during fabrication, including those that do not conform to the accepted proposal or space limitations, the finalist must consult with the Farnsworth curatorial staff. Works that differ markedly from the proposal submitted may be disqualified from the project. Installation will take place from November 13-21, 2018, and will be unveiled on November 23. Although proposals in all mediums are encouraged, thorough consideration should be taken to the fact that this is a temporary installation. Please use common sense in submitting designs with minimal impact on the space and that can be easily be removed at the end of the display period. If you have questions regarding limitations, please feel free to direct them to the email on this page. Submissions that are deemed unrealistic or potentially harmful to the space will not be considered. If you have any questions about program participation, please EMAIL. I love meeting people who I consider ‘salt of the earth’. People who are filled with fundamental goodness. One such person, who I was fortunate to meet many years ago, is Shirley Stenberg. While studying for her MA masters degree at USM Shirley developed instructional materials about each of the three well known Wyeth family artists; N.C., Andrew, and Jamie. The materials were developed for the use of teachers to help prepare their students for a field trip to the Wyeth Center at the Farnsworth Art Museum. Shirley’s creation of the Teacher’s Manual for those materials and her accumulated knowledge about the Wyeth painters had brought about her truly informed background about them and their works, which became a valuable resource for the Farnsworth during Shirley’s tenure as a Docent. All the while learning, Shirley became an “authority” on the three Wyeths. 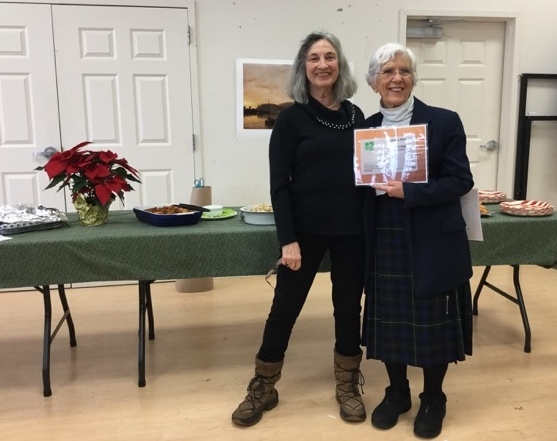 In December at a luncheon, Shirley was recognized for her quarter-century of volunteer service by the Farnsworth Art Museum Docents. She was presented with a lifetime membership to the Farnsworth. For several years Shirley had been a Community Representative to the Education Committee of the Board of Trustees and she served twice as the chair of the Docents. I had the opportunity to meet Shirley many years ago when I was teaching middle school students not to far from the Farnsworth. I quickly learned of Shirley’s knowledge which equaled her ability to connect with young adolescents. She was fabulous! I understand that Shirley received a standing ovation after her remarks. Much deserved by someone who is ‘salt of the earth’! 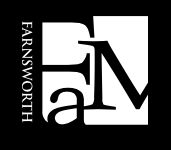 The Farnsworth Art Museum has several opportunities during December. On a Mountain in Maine opens on December 17th in the galleries. Dramatic Reading: All She Must Possess, Saturday, December 30, 2pm. New play about the famed art-collecting Cone Sisters of Baltimore.